Seems great so far! I would recommend Galvanoth , Increasing Vengeance (just a better Doublecast), Mana Geyser , Banefire , and especially Empty the Warrens . 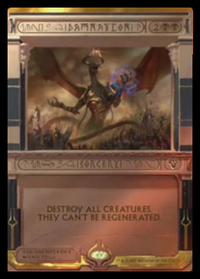 Niv-Mizzet, Parun, Djinn Illuminatus, Melek, Izzet Paragon, Galvanoth, and Crackling Drake are some creatures. Curiosity, Ophidian Eye, and Tandem Lookout go well with Niv-Mizzet, Parun, and as does Enter the Infinite. I've always thought that Crackleburr is fun. Stitch in Time/Ral Zarek and Krark's Thumb go together, and some good instants and sorceries are Risk Factor, Epic Experiment, Blast of Genius, Prophetic Bolt and Opt. 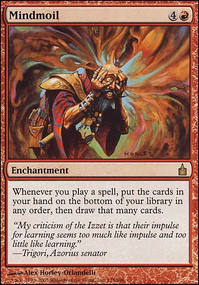 My favorite Izzet enchantments are Firemind's Research, Future Sight, Counterbalance, and Telepathy. Melek, Izzet Paragon, Goblin Electromancer, Galvanoth and Djinn Illuminatus are some creatures. Also, at the point that this deck is over $1000, i think you can afford to pay $3 for any form of Niv- Mizzet - namely, Niv-Mizzet, Parun, Niv-Mizzet, the Firemind, or Niv-Mizzet, Dracogenius. Boomerang and Vapor Snag are some return cards. Another return is Ral's Dispersal, which is only good with Ral, Caller of Storms. Tandem Lookout, Ophidian Eye, and Curiosity all go with Niv- Mizzet. 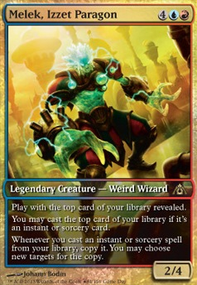 For the same reason as Goblin Electromancer, i think Jace's Sanctum and Baral, Chief of Compliance are good. As a fellow jeleva player, i think what the deck wants is more access to haste. Urabrask is cool, but costly and doesn't normally come out before Jeleva. Dragon Tempest, Swiftfoot Boots, Hanweir Battlements, Flamekin Village, Break Through the Line, and Hall of the Bandit Lord are all great options that are cheap. You want to make sure you can curve into Jeleva perfectly. Get a ramp spell and a haste source immediately and suddenly you're in business. another suggestion i might add is to consider ways to remove Jeleva yourself. I personally run five boardwipes to give me a better chance at clearing the board and giving me the opportunity to recast Jeleva for more value later on or next turn. also consider sacrifice outlets as a good, reliable way to get rid of Jeleva. High Market is great but consider Ashnod's Altar, Phyrexian Altar, and other sac outlets to consistently remove her. Additionally, i'm not crazy about some of the creature you have in the deck. The more creatures there are, the better chance you have of whiffing on a Jeleva cast. 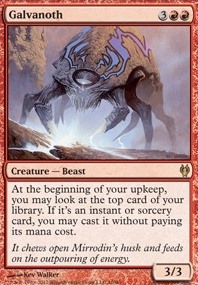 I'd focus it down to a couple creatures that will help your deck excel. Galvanoth is great to cheat out your spells, but you could probably cut down on some creatures in exchange for more utility pieces for your deck. Swarm Intelligence is a powerhouse card that could easily replace a creature. Silent-Blade Oni is a great "Gotcha!" card that with let you sneak in to steal a card (since no one ever blocks Jeleva, and she naturally has flying.) Wildfire Eternal is an absolute must have for the deck. Being able to cheat out multiple spells in a turn between Jeleva and Wildfire Eternal is back-breaking for the opposition. Finally, consider more ramp! There are a lot of great ramps spells to add. The Talismans, Fellwar Stone, and others will make the deck more consistent in making the deck function more quickly and getting Jeleva out on turn 2 or three is an awesome feeling. Really, unless you can win instantly after casting Enter the Infinite (Lotus Petal into Rite of Flame into Desperate Ritual into Seething Song into Mana Crypt into Mana Vault into Sol Ring into Zealous Conscripts+Kiki-Jiki, Mirror Breaker, etc.) don't run it. Leyline of Anticipation, Metallurgic Summonings, Omniscience, Stolen Strategy, Sunbird's Invocation, Swarm Intelligence, Mirari, Sentinel Tower, Swiftfoot Boots, Vedalken Orrery, Arcane Melee, Enhanced Surveillance, Jace's Sanctum, The Mirari Conjecture, Traumatize, Rise from the Tides, Crystal Shard, Expedition Map, Erratic Portal, Mana Cylix, Beacon Bolt, Stolen Identity, Laboratory Maniac, Melek, Izzet Paragon, Nivix Guildmage, Galvanoth, Echo Mage, Archaeomancer, Battle Hymn, and Fury Storm need to go, they don't do nearly enough. Up next on the chopping board are every extra turn spell and every 'copy' effect, whether copying a creature/permanent or spell. It needs to go. Past in Flames is about all like that that is necessary. I feel Inner Fire is particularly bad... there are more cards to consider dropping think Jace's Sanctum, the Electromancer and Baral, but for now, their okay. I have some ideas that might help to combo with the Instant and Sorcery synergy you have. Bloodfire Enforcers can get deadly once it is active and pumped; Trample and First Strike together make the damage hard to block or take to the face. Charmbreaker Devils helps with recursion, and also gets swull AF. Galvanoth lets you play an Instant or Sorcery for free, and also doesn't reveal your topdeck to the whole board if you can't cast it. Many of your Instants and Sorceries are cheap, so Goblin Dark-Dwellers might give you some utility mileage. 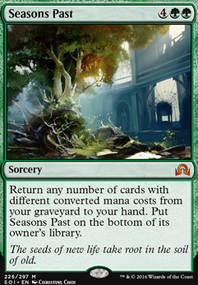 Essentially gives you another body on the board and a recast, so it's good card efficiency. Izzet Chemister can let you cast multiple Instants and Sorceries from your grave, giving you the ability to reach critical mass faster. You don't get triggers from copies, but Guttersnipe might still be useful for racking up passive damage. Finally, Sphinx-Bone Wand can help you win the game with direct damage if you can't get combat stuff through. Great deck! +1 from me. needs some more mana rocks: Coalition Relic, Worn Powerstone, Commander's Sphere and Fellwar Stone should do the trick. Should be running Past in Flames and Braid of Fire. might want Humble Defector for card draw, and if you are going the "i win cuz i have high life total kek" route, I might add Academy Rector and Test of Endurance. spicy idea: could run Galvanoth. Love the stuffy doll idea.